Despite some seriously wet weather, at about 5pm yesterday some curious – and noisy! – figures could be seen/heard wending their way around Barrow Park. Most of the day’s 7 Orchestrians were brand new to the world of using Arduino, so after a quick crash course we limited ourselves to using a vibrating motor each and some simple code that changed the number of buzzes depending on the direction being travelled. That and the most waterproof instrument builds we could manufacture! bird in a tin from nikkipugh on Vimeo. The bandstand in the park provided a nice setting for drifting around in large circles and we liked the idea of returning at a sunnier time (obviously not August – what were we thinking?!) and performing for an audience sat in the middle whilst watching us move around the outside. Thanks to our hosts and to everyone who took part. 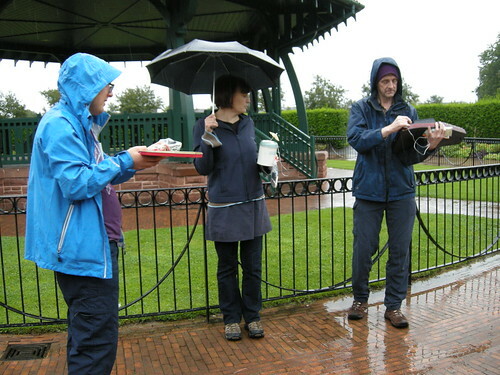 Keep an eye out for more GPS Orchestra workshops around the country over the following months, and also for further interesting things coming out of Barrow Park courtesy of Octopus.